A Conversation with Philip Glass on La Belle et la Bête by Jonathan Cott. JC: In fairy tales, there’s often a magic kingdom, an enchanted forest, or a mysterious castle where all kinds of transformations take place and which one enters with a combination of trepidation, fear, and excitement. In your version of La Belle et la Bête you, too, have entered this realm. When and why did you choose to do so? PG: I think that at a certain point of your life you start doing work you’ve been thinking about for a long time. In the case of La Belle et la Bête and my other Jean Cocteau projects — Orphée and Les Enfants Terribles — I’m finally doing pieces I’ve been wanting to do for at least twenty years. I first saw Cocteau’s films when I went to Paris in 1954 to study French. I was 17-years-old then, and the Paris I saw was the Paris of Cocteau. The bohemian life you see in Orphée was the life that I knew and was attracted to, and those characters were the people I hung out with. I visited painters’ studios and saw their work and I went to the Beaux Arts ball and stayed up all night and ran around. So there was a little bridge between his world and my world — a very tenuous one, and it didn’t last long because I left Paris soon after and didn’t return until 1964 when I stayed three years to study music. By that time that earlier world had been replaced by the world of Godard, Truffaut, and the rest of the New Wave — though it’s true that Jean-Louis Barrault was still at the Théatre de I’Odéon, and I remember seeing the premiere of Jean Genet’s play The Screens. In 1960 I studied in Aspen, Colorado with Darius Milhaud, who was certainly part of Cocteau’s world, and I always used to ask him about the collaborations he had done in the 20s and 30s because that’s what interested me. There was an esthetic, a view and vision about culture that affected me strongly in my teens and twenties and that has remained as a kernel inside me all this time. So when in the early 1990s I got around to doing a version of Orphée I knew exactly what I wanted to do… as I did with La Belle et la Bête. Both of these works are homages to Cocteau, whom I think of as an important twentieth-century artist. In his time he was thought of as being too facile; he wrote poetry and plays and novels, he painted, and he directed movies. And people quite incorrectly thought he was a dilettante. Today the French are dismissive and protective of him at the same time. But remember, even by 1954 Cocteau was already considered passé. The film Orphée, made in 1950, is an autobiographical work about an older artist displaced by a younger one. And whom is he killed by at the end? His fellow poets. When Orphée asserts to the critic that he’s adored by the public, the critic says, “But the public is alone.” (A wonderful line!) Orphée was both Cocteau’s complaint and his revenge, resurrecting in a contemporary setting the themes of immortality and art and love and placing himself in the center of it, which is something only a person of maturity and skill could have done. Cocteau’s various ways of working were actually various ways of looking at the same subject — the nature of the creative process — as if he were walking around it and seeing it from different points of view. JC: Don’t you think that in La Belle et la Bête, as in many of Cocteau’s works, the notion of the “wounded” artist is also at the center of his vision? PG: I do. But to me, La Belle is Cocteau’s most complete statement about the entire creative process. The film is clearly an allegorical story. We can take it as a fairy tale, a love story, and as a representation of the major preoccupation of Cocteau’s life. Many young people today know it only as the “Disney” animated fairy tale (which I haven’t seen). But the story interests me less as a fairy tale than as a love story. And as a love story I think it’s equal to Romeo and Juliet and to Tristan and Isolde — it’s an archetypal love story that goes right to the heart. Most of all, though, I’m interested in the third aspect, the clue to which lies in the journey that the father takes through the forest. He arrives at the castle — a magnificent, magical place. The woods seem to part in front of him… but the journey becomes a journey through the unconscious to the site of the creative — the artist going into himself. In the castle we find a half-man/half-beast whose power comes from magic and whose magic comes from five elements: the mirror, the key, the rose, the horse, and the glove. For anyone who knows Cocteau, the mirror is the passageway, the entrance to the otherworld or the world of the transcendent. The rose, of course, is beauty itself. The key is method. The horse represents strength and determination and speed. The glove — I pondered this for a while — represents nobility, the true estate of the artist. So Cocteau is making an interesting statement here, which is that the artist is the embodiment of humanity’s nobility. He requires courage, strength, determination, a vision of transcendence and beauty and a method. But why is he, trapped in the castle? Because, as the Beast knows, only the look of love can save him. That’s the sixth element. The film is about the transformation of half-beast/half-human — which is what we are — to the state of the nobility of the artist, which the Beast becomes at the end. Arid the ending in which Beauty and Beast fly away to the kingdom becomes the final transformation of the artist. Before that moment, the Beast knows who he himself is, but he can’t be who he is. And isn’t that the very state we’re in when we’re trying to do our creative work? How do we become who we are? Any artist can attest to this problem. JC: But isn’t all of this just as true for any human being? PG: Of course. And in fact the journey of the artist is the journey of everyone. Because we can also look at transformation in a purely spiritual way. But that’s not necessarily Cocteau’s vision. Even though he may not have seen it that way, we can take it in that direction if we like. Beauty is the missing link. But the Beast can’t be liberated until he gives her up. By giving up love he gains it. PG: Exactly. So she must leave the castle, return to her father, then come back to the Beast with her glance of love. Until that happens he’s trapped. And he won’t have that until he liberates her and runs the risk of dying. Then love comes back, he becomes blessed by it and is transformed. JC: In the movie you see the Beast lying on the ground, dying, just before he’s reborn. PG: That’s right — reborn as the prince, as the artist… All of which is to say that the entire film is really about the father, the film is taking place inside the mind of the father. Maybe this is an extreme way of looking at it, but the movie isn’t really about Beauty. Beauty only has to be beauty, she doesn’t have to be anything else. JC: But she needs courage since she overcomes her initial horror of the Beast when she first sees him. PG: That’s true. She’s courageous and she’s a pure person. She is the one who will transmit the glance of love. She’s innocent, and she hasn’t fallen into the human world the way the of us have. We have to learn and earn compassion, but she has it because of who she is. To me, the whole action of the story is orchestrated by the Beast. He knows he has the five magic elements, and he’s aware of what is missing. So he bewitches the father into coming to the castle. He knows about the father’s daughters, he knows Beauty is one of them, and he’s determined to get her there. Now this is where the music actually interacts with the film. I saw that the Beast was playing with the father: “Maybe if your daughter comes she can replace you…”, he says slyly. And if you observe how the music works, there’s a descending bass line at that point that almost sounds like someone laughing… because I think the Beast is laughing, and I’ve taken that element and put it into the music. I could have done the scene as a threatening one. But I did it for the humor since it was that side I wanted to bring out. And by doing it that way I tried to suggest the foreknowledge the Beast has of the elaborate mechanism that has to occur to bring about his own transformation. JC: This is in contrast to the false, malicious, grating laughter of Beauty’s two sisters that we hear at the opening of the film. PG: That’s right. In those first scenes the music is very light, and you don’t know what’s going to happen. Cocteau presented us with a problem because the initial set-up of the story is packed into the first ten minutes of the movie — we see the sisters, the brother, the father’s boats have been lost at sea — and you don’t know what’s going on. Only when the father gets on his horse and starts his journey do you feel the piece is really beginning. When the father returns from his trip and Beauty realizes she has to go to the castle in his place, we have a series of seven or eight scenes focusing on her and the Beast. I had to write not just one or two motifs or themes but many of them — one or two weren’t sufficient. For example, there’s a motif for the journey to the castle — you hear it every time the horse appears; then there’s one for the actual vision of the castle — the overview of the castle; then another for the moment when Beauty faints and the Beast carries her to the bed — in a sense, that’s his falling-in-love theme (to put it in crude terms), that’s the music when he sees her; then a passage when she’s walking in the woods and he comes towards her with his smoking gloves; then a theme when she spies him drinking the water.. and that’s when we start to get into the music that they share, the music of their “relationship”: there’s music for their walking in the woods, which is their kind of traveling music, it’s the music that they go places together with, if I can put it that way, and which returns at the end when they fly off holding hands into the sky. At the conclusion of the film all of this music returns — the walking-in-the-woods music, the castle music, the “relationship” music. After I’d completed the opera, I decided to go back to the beginning and write an overture because that introductory story material was much too confusing, and I wanted to suggest the emotional and romantic depth of the piece. So I took all my musical themes, strung them out in a kind of Rossini overture-type, manner — take all your tunes and trot them out — but I also meant to give a kind of premonition of what was to come. JC: La Belle et la Bête is a French movie, you love French music, you’ve studied with French music teachers, and in this work your use of whole tone scales and directionless ostinati suggest a bit the mood of operas like Debussy’s Pelléas et Mélisande and of Ravel’s L’Enfant et les sortilèges. PG: I studied with Darius Milhaud and with Nadia Boulanger, and her teacher was Gabriel Fauré… so what can I tell you! It’s sometimes said that Americans choose either the French school or the German school — clearly, I choose the former. Because of my inescapable attraction to French culture, it had to be that way. But what’s interesting is not how my La Belle sounds like Debussy, but how it doesn’t. When we first see the Beast, we do so in E major and C major — we hear E major triads ringing on the top, followed by C major triads below — and when you put them together you have the whole tone scale and an augmented triad. If you analyze the augmented triad out into its parts, you have two harmonies a major third apart that give you one of the more distant key relationships. Within the world of tonality we’re taking two of the more distant relationships and unifying them in a whole tone scale. The reason my music for La Belle sounds different from Debussy, I think, is because of my way of going through the augmented triad to what I think are its sources. For Debussy, tonality was redefined by music free from traditional root movement. Then there’s the rhythmical development that you typically find in my works and that comes from my association with non-Western music, particularly Indian classical music. Unlike Einstein on the Beach, this aspect is no longer the foreground of my new piece, and now appears more in the background. La Belle is filled with compound meters derived from combining rhythms based on 3’s and 2’s and building overall rhythmic structures based on smaller units… But the heart of the piece is really in the harmonic language we were talking about. JC: La Belle et la Bête is particularly striking for the transparency and clarity of its vocal writing. PG: The big challenge in opera lies exactly in this. Satyagraha was the first opera in which I began to think of the vocal line as floating and free from its harmonic and rhythmic setting. Now, ten operas later, I’ve acquired a distinct vocal style of my own along with a real confidence about writing for the voice. In the two Cocteau operas, the vocal line has begun to shine, it draws you into it through the voice, which has acquired a kind of authority it didn’t have in the earlier works. In much twentieth-century opera, there’s a fixation on writing disjointed melodic material, as if modern music shouldn’t be melodic. God forbid that a melodic line should contain step-wise movement! I’m either on the harmony or not on the harmony. I can be either on one or the other, and once I’ve decided where I’m going to be, I go there in the simplest way, which is usually step-wise. For me, the setting of the text and the shape of the line are closely connected. What is it one is saying? What is it one is singing? In the old days I tended to write operas in languages I didn’t know like Sanskrit and Ancient Egyptian. These days I prefer to write in languages I do know — English, French, Portuguese — because the way the word fits into the context of the sentence will determine a lot about where it will fit into the music. One has to be careful to avoid casual or unpremeditated resolutions. You have to look at the harmonic situation and the meaning of the words and then you’ll find where to place them. It’s from Handel that I’ve learned more than from any other composer for the voice about how to exercise the voice — taking it from its high to its middle to its low range, not leaving it in one part of the voice for too long. So a singer of my recent work can now count on using the whole range of the voice in the course of an evening, which is less tiring and more beautiful and which, in the end, is more expressive. Singers have taught me what they could and could not sing. I asked them and I still ask them. JC: Your version of La Belle et la Bête seems like a perfect example of Wagnerian Gesamtkunstwerk. PG: The very idea of the project is the vision: “I’m going to take La Belle et la Bête, eliminate the sound track, write a new fully operatic score and synchronize it with the film.” You know, someone has to synchronize the film with the music, and also someone has to do the programming — in this production that someone is the musical director Michael Riesman. And the sound designer Kurt Munkacsi (also the record producer) must translate that into a finished musical result, which must then be brought to the stage by Jedediah Wheeler. People might think we’re some kind of technicranks who are just fiddling around with a masterpiece using calculators and computers. In one or two interviews I have, talked about how I took the film and put a time code on it, timed every line in it, wrote down the libretto (which is not the same as the published one, since I wanted the words that were in the film), I timed every word, I placed it mathematically in the score… and then when I got done, Michael Riesman and I recorded it and put it up against the film and discovered it wasn’t accurate enough. So we began using computers to move the vocal line around until it synched with the lips, and then I had to rewrite the music in order to achieve a better synchronization. Then Michael had to teach it all to the singers and they had to learn to do it live. JC: As it exists now, the production presents the singers who, when they’re not singing directly to the audience, turn around to watch the screen on which they can see their own characters. And that itself is a wonderful conception. PG: Charlie Otte, who was Bob Wilson’s assistant-stage director in the 1992 version of Einstein on the Beach, set that tip. There are moments when Beauty is on the screen and our Beauty is looking up at her, and I could almost cry. Then there’s the scene where the Beast is dying and our Beast is singing, and the two of them together make you realize that this is a music-theater experience, not just a film. There will never be a film of the final, synchronized version of this production. There already is a soundtrack to the original film by Georges Auric, whereas mine is a music-theater work with a film. And I think that the counterpoint between performer and image is wonderful. JC: In practice, your production seems to break up and see through the relationship between the mask and the character so that, for example, one inescapably senses the true being of the Beast as one listens to his inner voice. PG: I said to someone that my La Belle wouldn’t be a deconstructed version of the movie, but in a way it is. We’re peeling away layers of illusion, and when we do that it enriches our experience. JC.— Finally, the inevitable last question: Do you think Jean Cocteau would have liked the Philip Glass La Belle et la Bête? PG: Do you know the story about Jean Genet who was once being interviewed by a young British journalist? The journalist said, “M. Genet, there’s a story that as a very young boy you were arrested on a train because you didn’t have a ticket and were taken off to a reform school. If that hadn’t happened, how would your life have changed?” Genet was quiet for a long time, and then said to the journalist, “Do you believe in God?” And the guy mumbled something like, “Some days I don’t, some days I do.” And Genet exclaimed, somewhat ferociously, “Well, go ask him!”. An opera by Philip Glass for ensemble and film. Based on the film by Jean Cocteau. Theatrical Production by Jedediah Wheeler. 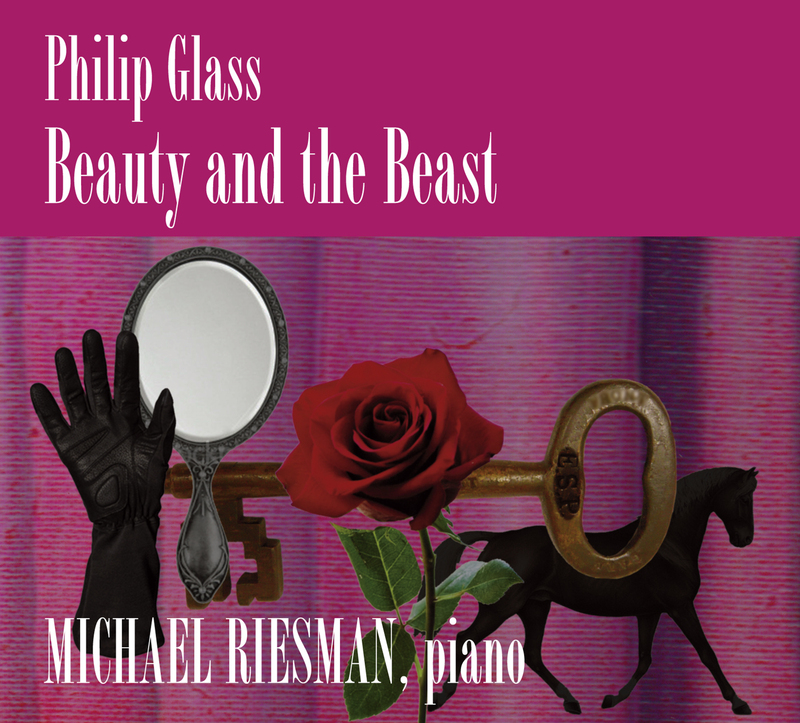 Performed by The Philip Glass Ensemble: Philip Glass: keyboards. Michael Riesman: musical director, keyboards. Jon Gibson: soprano saxophone, flute. Martin Goldray: keyboards. Richard Peck, alto and soprano saxophone. Eleanor Sandresky: keyboards. Andrew Sterman: flute, piccolo, soprano saxophone, bass clarinet. Cast: Janice Felty, mezzo-soprano: Beauty. Gregory Purnhage, baritone: The Beast, The Port Official, Avenant, Ardent. John Kuether, baritone: The Father, The Usurer. Ana Maria Martinez, soprano: Felice. Hallie Neill, soprano: Adelaide. Zheng Zhou, baritone: Ludovic. Guest Musicians: Violins: Sanford Allen, Tim Baker, Regis Iandiorio, Karen Karlsrud, Jenny Koo, Jan Mullen, Linda Quan, Sergiu Schwartz. Violas: Alfred Brown, John Dexter, Stephanie Fricker. Cellos: Seymour Barab, Semyon Fridman, Beverly Lauridsen. Basson: Charles McCracken. French Horn: Sharon Moe. Tenor Trombone: James Pugh. Bass Trombone, Tuba: Alan Raph. Produced by Kurt Munkacsi for Euphorbia Productions Ltd., New York. Recorded and mixed at The Looking Glass Studios, New York. Engineers: Anne Pope, Rich Costey. Assistant engineers: Leonardo Heiblum, James Law, Dave Porter, Amanda Riesman. Synthesizer sound design: Michael Riesman. Synthesizer programming assistance: MacDonald Quayle, John Witte. French language consultant: Lisa M. Glaeser. Music preparation: Lisa Bielawa, Peter Foley, Ken Willians. Production coordinator: Sharon Ainsberg. Production assistants: Warren Fischer, Leonardo Heiblum, Amanda Riesman. Photographs on La Belle et la Bête, a film by Jean Cocteau, by G. R. Aldo. Music published by Dunvagen Music Publishers, Inc.
Orange Mountain Music is proud to announce the new double album, PERPETULUM, by Grammy-winning percussion ensemble Third Coast Percussion. The new album features all new music including the world premiere recordings of new works by Philip Glass, Gavin Bryars, David Skidmore, Peter Martin, and Robert Dillon. © 2019 PHILIP GLASS. ALL RIGHTS RESERVED.